I got this gorgeous large vase in about 1994 from a shop that was closing down and have managed to keep it safe while raising four children I would love to know anything about the potter who created it. 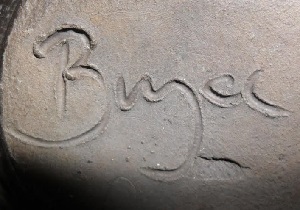 The name on the bottom appears to be 'Bryce' at my best guess. We had a question about this potter Bryce before, but there has been no response so far. They suggest that it may be Bryce Stevens. I googled Bryce Stevens and he worked at Coromandel and the Waikato it seems. It appears that he has gone to Potters Heaven .... ? Where did you find your pot? 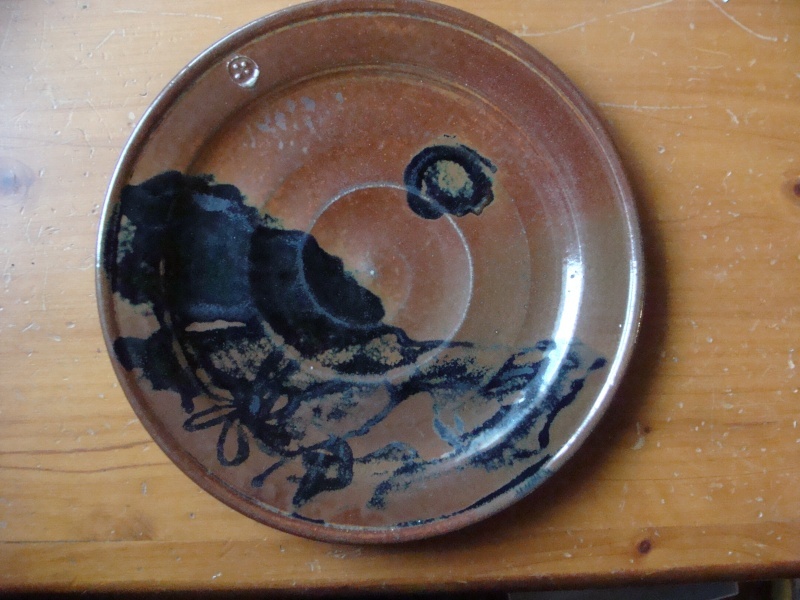 Bryce Stevens has a mark in the Marks of New Zealand Potters book and it reminds me of the holes in a button ....[?] circular with a cross. 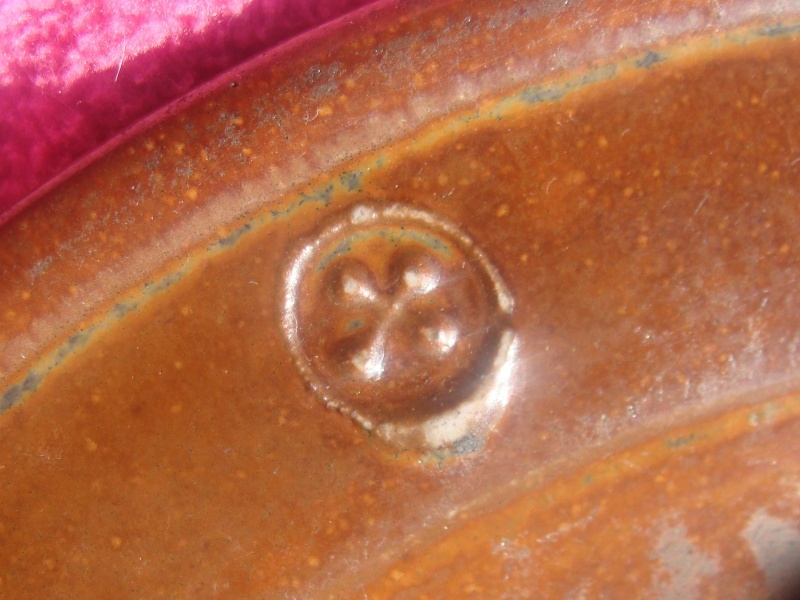 I will continue to find out more about him as that pot makes it worth finding some more info! 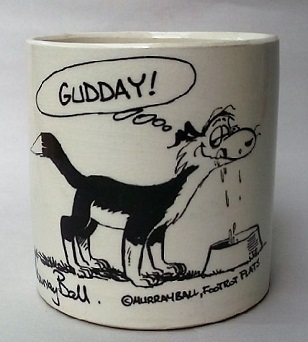 As this old Bryce Stevens auction on Trade Me mentions a business card inside the pot that is signed Bryce ..... I would consider that to be a sign that the maker of your pot is Bryce Stevens! Thank you so much, I found this beauty in Palmerston North in a craft/home decorating sort of shop 2 doors down from where I was working in Coleman Mall (which is a small street, not a shopping centre lol), I would have been 18. I fell for it the moment I saw it but it was $80 and it took me a while to save for it - and the shop was closing down- finally I had my $80 and I went in to buy it - and it had been reduced to half price as it was their last day of trading! Sad for them, but my lucky day its belly is about as big as a basket ball! I'm adding another pic, of the other side. The colour is more accurate in this one - not quite, but close. Oh Wow I didn't realise that this pot was pit fired! It will be rather fragile, even though it looks so robust. I will put his mark in the Potters Marks Gallery and credit you for the photo. Also will add Bryce Stevens to the title and move this thread to the Studio Potters category. 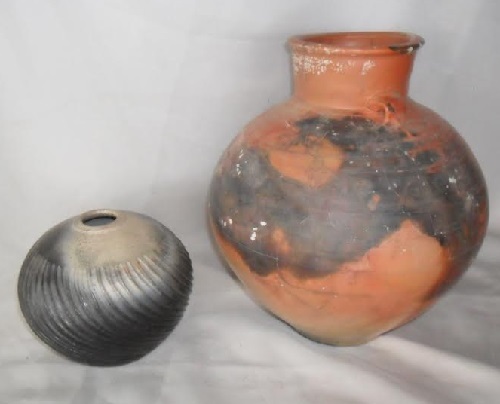 Bryce Stevens established his pottery on the Coromandel Peninsula in 1969, calling it "Tapu Creek Potteries". At some stage he moved to Hamilton and taught, working out of a space in the old Claudelands Railway station. Incidentally, this was either the same place or adjacent to the place Hereford Fine China had operated out of under Rick Lewis (of Royal Worcester fame). Incidentally incidentally, Mary Bailey, who started working for Titian early on, doing their gilding, having been trained by Royal Doulton; ended her days here in suburban Hamilton doing all the specialized ceramic gilding for Hereford Fine China (in the end a Hamilton subsidiary of Crown Lynn). Gosh, it was a small world wasn't it?! Bryce Stevens seems to have eventually moved back to the Coromandel to set up another pottery where he passed away still quite young.